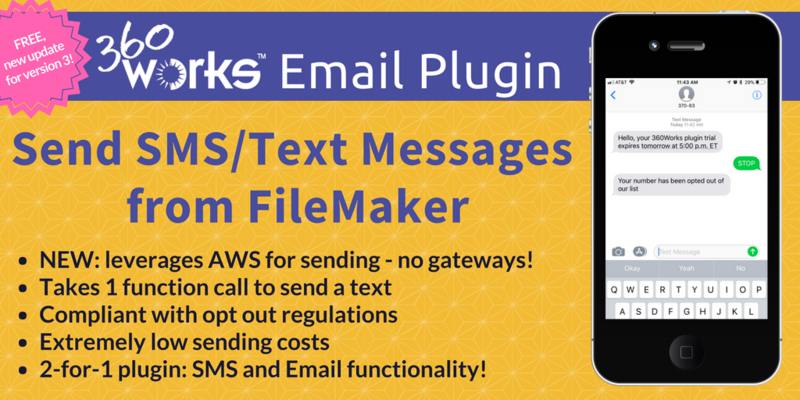 How to Send Text Messages from FileMaker - New Email Plugin Update Now Leverages AWS for SMS Sending! Virtually any case you can think of where a mobile message service is needed! Where required by local laws and regulations (such as the US and Canada), SMS recipients can use their devices to opt out. Developers can manage sending settings in their AWS console. Using the 360Works Email Plugin is a great way to send SMS in FileMaker Go. You can trigger a script on a machine that has the Email Plugin installed. Using FileMaker Server, you can have routine scripts that will process all the outstanding function calls or even use 360Works RemoteScripter Plugin to trigger server side scripts. Your users can send text messages from their FileMaker Go custom app, whether using an iPhone on the field or an iPad throughout the office. The Email Plugin is essentially a 2-for-1 deal. When you purchase it you receive the SMS/text message functionality as well as the powerful email sending capabilities of the plugin, such as sending and receiving HTML formatted and multiple attachment emails with SMTP, POP, and IMAP servers. The Email Plugin starts at $195 and is available with 3 different tiers: Single-User, Workgroup (10 users - local use), Enterprise, and Solution (Vertical Market option). If you plan to use the Email Plugin for server-side use of any kind, such as SMS in FileMaker Go, you will need the Enterprise license. This new version, Email Plugin 3.1, is a free update for those currently using major version 3. You can go right to the Email Plugin page and download the current version. Sending costs are extremely low and handled through AWS. The first 100 messages sent to US numbers are free. Messages after 100 sent and any non-US numbers incur a per message charge, pricing can be found in our docs wiki (docs.360works.com). Currently, this charge is less than a penny per SMS. If you would like implementation services, please contact us at infobox@360works.com and we will be happy to take care of the entire SMS implementation process for you or provide a guided walk-through at our hourly consulting rate. It is free to try the Email Plugin. There is a fully-functional demo version available and you can test the functionality in our sample file as well. "I wanted to publicly thank Sam Barnum from 360Works for OUTSTANDING customer support! I needed to be able to put inline graphics into outgoing "blast" emails for one of my clients. We use 360Works' email plug-in for it's ability to run from a script running in FMPS - these "blasts" go out to a few thousand people and run at night. Sam responded immediately to my request for help, offered to make an addition to the plug-in to handle the inline graphics and built it for me in very short order... So, THANK YOU SAM. And thank you 360Works." ?Mark Woytovich, Ignotum Inc.